I wanted to be included. My 3D Visualisation service brings me into contact with Interior Designers aplenty, so this editorial would also benefit the many Interior Designers reading the magazine by learning more about my work and how it could benefit their design services too. Plus, this magazine was uber chic and contemporary. Bonus points! I set about contacting the Editor and before I knew it, I was asked to forward a few examples of my 3D visuals and a narrative to explain my 3D Visualisation service. 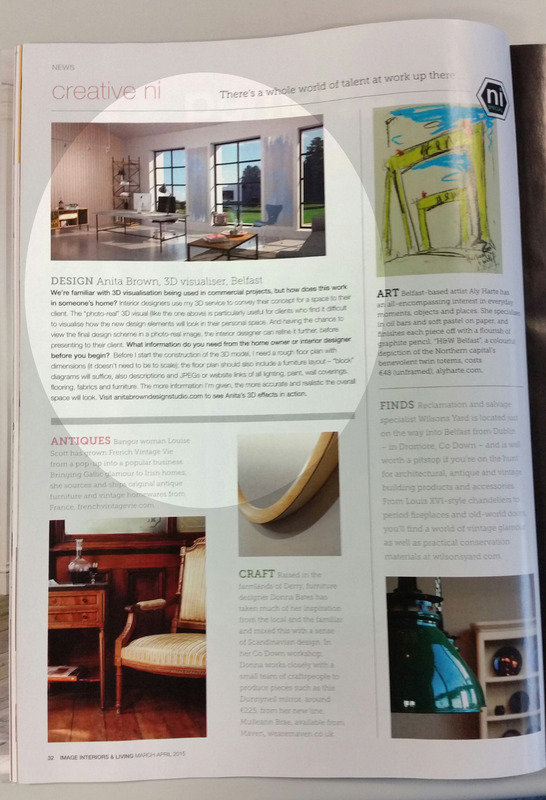 My new BFF (the Editor), who seemed a very lovely lady, informed me within a week or so that Anita Brown Design Studio would indeed be one of the creative industries featured in the Magazine. I want to say that I was extremely casual and reserved about the whole thing. But I wasn’t. On the morning the magazine hit the newsstands, I ran (I never run. Ever) to my local newsagents. I was reliably informed that there was a delay in getting the magazines delivered to Northern Ireland and it would be available the following morning. To cut a long story short, I got my grubby hands on said publication the next day and shoved it under the noses of my friends and family, whether they liked it or not.